As special counsel Robert Mueller’s inquiry into Russian involvement in the 2016 election continues, most Americans express confidence in him to conduct a fair investigation. But the public is far less confident in Donald Trump to handle matters related to the investigation appropriately. Republicans and Democrats offer starkly different assessments of Mueller’s conduct of the investigation and Trump’s ability to deal with it, and these partisan differences extend to views of the importance of the investigation itself. Overall, most Americans (55%) say they are either very (28%) or somewhat (27%) confident that Mueller will conduct a fair investigation into Russian involvement in the 2016 election. Four-in-ten say they are not too (19%) or not at all confident (21%) in his ability to do this. The public expresses less confidence in Trump. 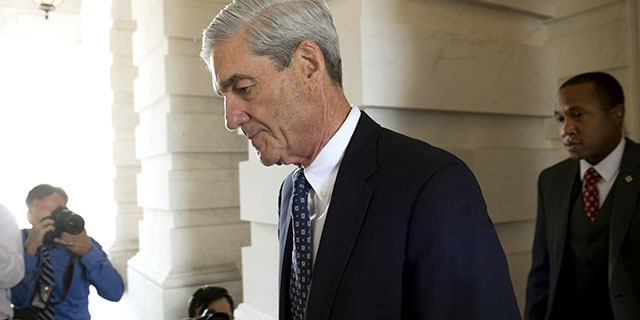 Just 41% say they are very or somewhat confident that he will handle matters related to the special counsel investigation appropriately, while most (57%) say they are not too or not at all confident that he will do this, according to a national Pew Research Center survey conducted June 5-12 among 2,002 adults. Confidence in Mueller has edged lower since March, when 61% were confident he would lead a fair investigation. Views have shifted, in part, due to declining assessments among Republicans. Most Republicans and Republican leaners now say they are not too or not at all confident that Mueller will conduct a fair investigation (56%), while 38% say they are at least somewhat confident that he will do so. Republican views toward Mueller are more negative than they were in March, when 46% expressed confidence and 50% did not. 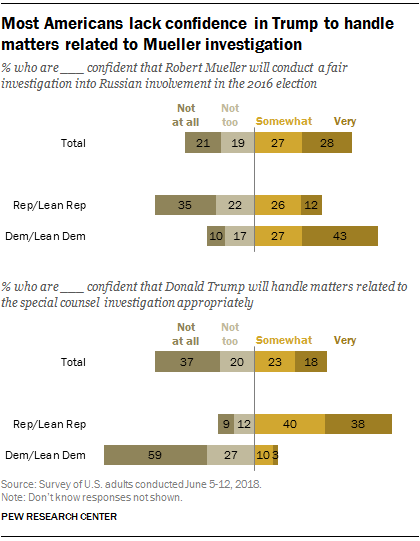 By contrast, seven-in-ten Democrats and Democratic leaners are very (43%) or somewhat (27%) confident that Mueller’s investigation will be fair. The share of Democrats who express confidence in Mueller has held mostly stable over four surveys conducted since last December. Views of Trump and how he will handle matters related to the Russia investigation are even more polarized than views of Mueller. A clear majority of Republicans and Republican leaners say they are confident that Trump will handle matters related to the investigation appropriately (78%) – though the shares saying they are very and somewhat confident in him are about the same (38% vs. 40%). By contrast, 86% of Democrats and Democratic leaners say they lack confidence in Trump to handle the matter appropriately, including 59% who say they are not at all confident in him. While a larger share of the public has confidence in Mueller (55%) than in Trump (41%) when it comes to their respective roles with the Russia investigation, there is a great deal of variation across demographic groups in the size and direction of this confidence gap. Women are much more likely to say they are at least somewhat confident in Mueller to conduct a fair investigation (57%) than to say they have confidence in Trump to handle matters related to the investigation appropriately (37%). The gap in views is more modest among men: 52% have confidence in Mueller, while slightly fewer (45%) have confidence in Trump. Adults ages 18 to 29 are 23 percentage points more likely to express confidence in Mueller (55%) than in Trump (32%). By contrast, those 65 and older are about as likely to say they have confidence in Trump as in Mueller (48% vs. 52%). There is an especially wide confidence gap in views of Trump and Mueller among college graduates and postgraduates. Those with a college degree are 29 points more likely to express confidence in Mueller than in Trump (63% vs. 34%); among postgraduates the gap is 37 points (69% vs. 32%). The pattern of opinion is very different among those with no more than a high school diploma: 49% say they have confidence in Mueller to conduct a fair investigation, compared with 44% who are confident in Trump to handle the matter appropriately. Among whites without a college degree, a narrow majority (54%) says it is confident in Trump to handle the matter appropriately; 51% say they are confident Mueller will conduct a fair investigation. Among whites who have graduated from college, nearly two-thirds (64%) are confident in Mueller, while just 37% are confident in Trump. About two-thirds (64%) say they consider the investigation into alleged Russian involvement in the 2016 election to be either very (42%) or somewhat (22%) important for the country. A smaller share (34%) says the investigation is not too (12%) or not at all (22%) important. The partisan gap in views of the investigation’s significance is quite large. Nearly nine-in-ten Democrats and Democratic leaners (88%) think the investigation is important (64% call it very important). 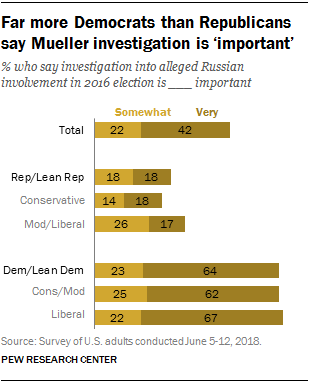 Just 36% of Republicans and Republican leaners call the Russia investigation very (18%) or somewhat (18%) important for the country. Among Republicans, self-described moderates and liberals are more likely to say the investigation is important than are conservatives (43% vs. 31%). There is no significant gap in views among Democrats by ideology.